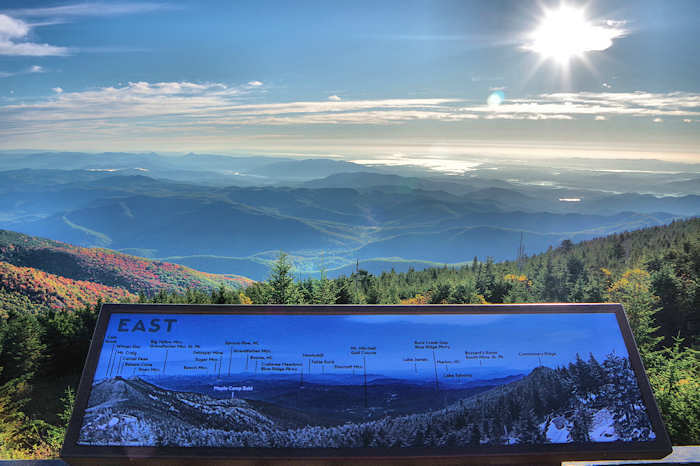 Mount Mitchell (elevation 6,684 ft.) is the highest point east of the Mississippi River, and it's easy and free for all to enjoy. 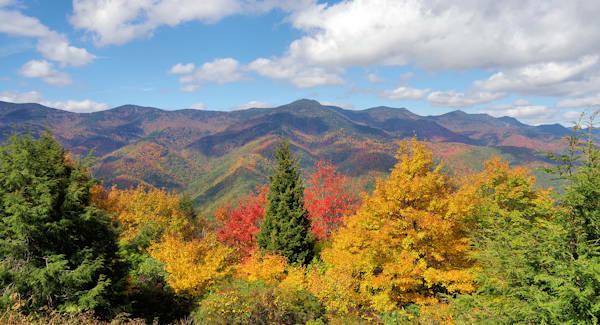 Located 35 miles northeast of downtown Asheville, reach Mount Mitchell via a very scenic drive on the Blue Ridge Parkway. From the Parkway, drive NC Highway 128 all the way to the summit. From the parking area, walk up a 1/4-mile paved, accessible trail to the observation deck for 360-degree panoramic views. What's new in 2019? The State Park will double in size thanks to the 2,700 acres of land purchased by The Conservation Fund. During the next two years, the park will receive $600,000 of improvements to support the 400,000 visitors per year. See the above view of Mt. Mitchell from the Blue Ridge Parkway near Milepost 350. Because of the altitude, many of the plants and animals are like those native to the alpine environments of Canada. Mt. Mitchell is part of the Black Mountain range, formed more than a billion years ago. 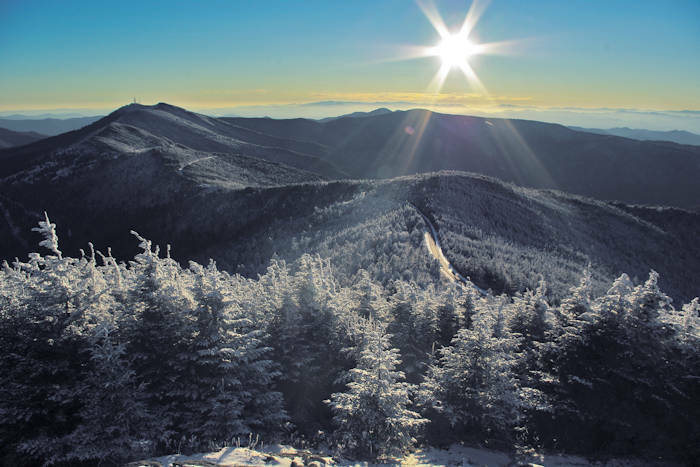 Six peaks in the small range are among the ten highest in the eastern United States, including Mount Craig (6,647 ft.), Balsam Cone (6,621 feet), Big Tom (6,581 ft.) and Mount Gibbes (6,571 ft.). Read more in the summit museum. Both it and the restaurant are open May-October. Bring a jacket or an extra layer of clothes. Temperatures are usually 10-30 degrees cooler than Asheville. Weather conditions can change rapidly. Take rain gear along if you are hiking. Eight out of ten days, the summit is covered in clouds and fog. Watch the weather and try to visit when skies are very clear in Asheville. Allow plenty of driving time to reach Mt. Mitchell (at least one hour from Asheville). The entrance is from the Blue Ridge Parkway and the traffic can be slow, especially on the weekends. The park is open year-round unless the roads there are covered in snow and ice. Since sections of the Blue Ridge Parkway close during much of the winter between Asheville and Mt. Mitchell, the only winter access is taking the Parkway south from NC Highway 80. Clear winter days can provide the longest views, but the wind and frigid temperatures can be unbearable. Call the Park office at 828-675-4611 to check winter road conditions. Enjoy a relaxing meal in the restaurant, located a half-mile from the entrance of the park. Open May through October, it has a casual menu and scenic views. There's also a small gift shop and a "porch" with rocking chairs. The summit exhibit hall, concession stand and gift shop are also open May through October. Take a short hike on a paved trail (1/4-mile) to the Observation Deck atop Mt. Mitchell. It's ADA wheelchair accessible all the way (but uphill). Have a mile-high picnic. The shady picnic area, the highest in Eastern America, is located at the north end of the summit parking lot. Forty picnic tables, stone grills and drinking water supply all the essentials. Two picnic shelters with fireplaces are perfect for group picnics. 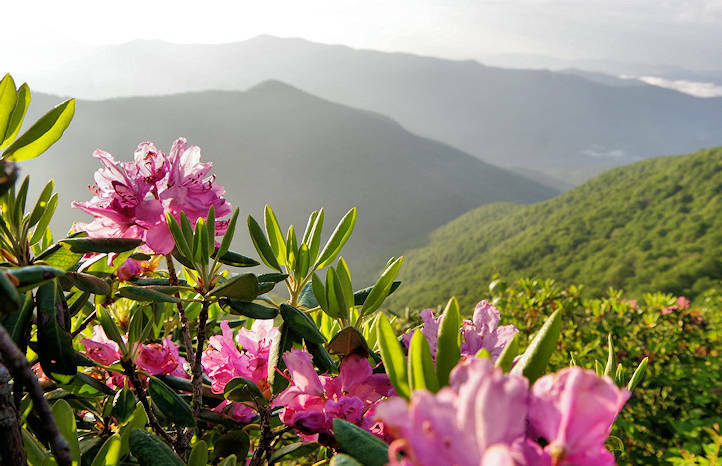 To enjoy the diverse flora and fauna in the forests on the summit, take a walk on the loftiest North Carolina hiking trails. Even a short walk can be very rewarding. 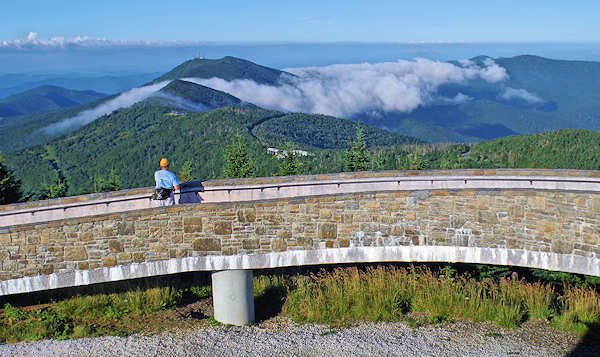 Deep Gap Trail: For great views of Mount Mitchell from Mount Craig (6,647 ft., the second highest peak in the eastern United States), take a two-mile round-trip hike through a Canadian-like forest. Deep Gap Trail begins at the picnic area near the beginning of the summit parking area. You will descend Mitchell and climb to the peak of Craig. And you can continue for a longer hike. See our Deep Gap Trail / Mt. Craig Guide. Balsam Trail: This easy, self-guided interpretive trail gives a glimpse at the effects of acid rain. This 3/4-mile loop trail begins near the observation deck. 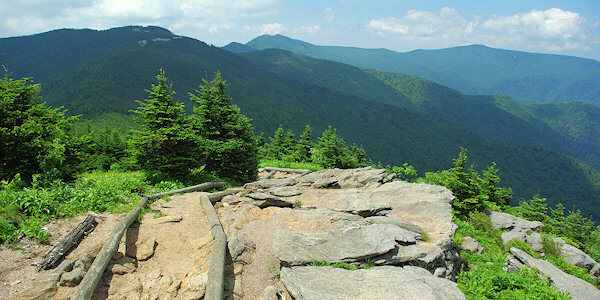 Go to the top of the observation deck, and as you head back to the parking lot, look for the Balsam Trail on the right. The trails ends at the parking lot. Pick up a guide at the park office or summit gift shop. See our Winter Hike on the Balsam Trail. Mount Mitchell Trail: This long, strenuous hiking trail leads from the Black Mountain Campground to the summit. Most of the trail is on USFS property. Climbs 3,600 ft. in 5.5 miles. It's steep and rough in sections, but there are spectacular views. You'll travel through a mixed hardwood forest at lower elevations, dense, old-growth spruce forests in upper elevations, and almost pure stands of Fraser Fir at the top. An alternate trail to Higgins Bald adds 0.2 miles to the length. This path is shared with the Mountains to Sea Trail along its entire route. Many folks park one car at the top and leave from another car at the Campground, so you can easily hike this in one day. When leaving the campground (Setrock Creek Falls is nearby), the trail crosses a bridge over the South Toe River and enters a hardwood and evergreen forest. After many tight switchbacks up steep terrain, the trail crosses Higgins Bald Trail at 1.5 miles. After four miles, the trail passes the remaining foundations of the 1920 Camp Alice logging camp. 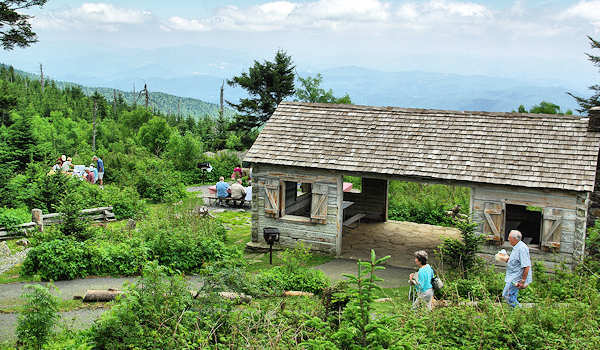 The trail then joins the Balsam Trail at mile 5.2 at the observation tower on Mount Mitchell. Just 0.3 mile farther is the parking lot. Want to add another 3.3 miles? Start your hike at Green Knob Lookout Tower instead! The nine-site family campground is open May-October, with full facilities. Winter camping is available, depending on weather, with limited facilities. Only tent camping is allowed. Each site is equipped with a grill and picnic table. Modern restrooms for use during warm seasons are located nearby. Showers and hot water are not provided. Reserve a space online. Pets are permitted in the park and on hiking trails so long as they are on a leash no longer than 6 feet. Mount Mitchell is often covered in clouds and fog that are sometimes as acidic as vinegar. In spite of the losses suffered due to this and the balsam woolly adelgid that killed many hemlocks on the mountain, the flora of Mount Mitchell remains among the most distinctive and diverse in the Southern Appalachians. Bird watchers have recorded 91 species in the park. Birds more characteristic of New England and Canada. The best way to get to Mt. Mitchell from Asheville is via the Blue Ridge Parkway (Milepost 355.4). From the Parkway's Folk Center, just outside of Asheville, it's a 27-mile beautiful drive (mostly up!). Allow one hour to drive, since traffic can be slow and you'll want to stop at overlooks along the way. This section of the Parkway is closed much of the winter. The alternate route is to take I-40 East from Asheville to Exit 86 (Marion). Follow U.S. 221 North about 10 miles to U.S. 70 West. Go about two miles to NC Highway 80 and go north to the Parkway. Drive south on the Parkway to the entrance of Mt. Mitchell State Park. Also see: Mount Mitchell Scenic Byway. Closed Christmas Day and for snow/ice. 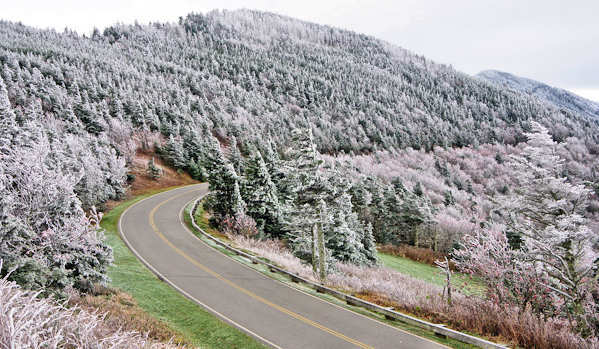 During the winter months, call the park office (828-675-4611) to see which roads are open. Mt. Mitchell averages 100+ inches of snow each winter. Bring a jacket since it's often 10-30 degrees cooler than Asheville. 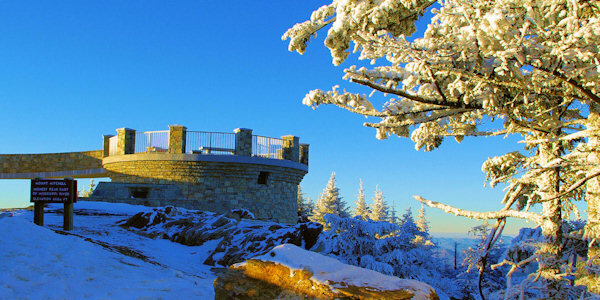 The weather on Mount Mitchell is very mild in the summer and very harsh in the winter. The coldest temperature ever recorded in the state (34 F degrees below zero) occurred there on January 21, 1985. Unlike the lower elevations around Asheville, snow is typical from November to March with an average of 90 inches each year. Snow flurries have been reported on the summit even in the summer months of June, July, and August. The summit is often windy, with the record being 178 MPH. Visit during the winter! Two waterfalls at the base of Mt. Mitchell, located near the Blue Ridge Parkway, are Roaring Fork Falls and Setrock Creek Falls.